See how we are, me and you? Listen to the complete album & learn more about Life Death Love & Freedom by checking out the e-card. Deluxe Edition includes both Life Death Love and Freedom along with Life Death LIVE and Freedom. 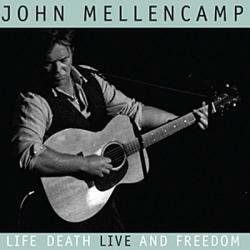 Long before the release of the album that would eventually be titled Life Death Love and Freedom, John Mellencamp debuted songs from that then work-in-progress for audiences all over North America. It was an unusual move for an artist whose body of work was so well known and revered, but as John will tell you, he’s never one to look back all that much. What’s in the past stays there; we can only deal with now if we’re to have some kind of impact on the future. By the fall of 2007, with T Bone Burnett producing, he had recorded most of the tracks for his new album and then proceeded to road test them with any and every audience he would encounter. John characterized these new songs as being in the tradition of the American songbook. They would only live if they were played for real people. Scarecrow album, the groundbreaking work that foretold the roots/Americana/No Depression movement that would become a codified genre more than a dozen years later. He kicked things off at Farm Aid 2007 on September 9th of that year, when he audaciously opened his set with “Troubled Land,” a brand new song performed in front of a massive audience. The song that addresses the American malaise so evocatively went over with the politically aware and socially conscious audience like gangbusters. He also performed a driving version of “If I Die Sudden” that was equally riveting despite the crowd’s unfamiliarity. Less than one month later he felt compelled to post “Jena” on mellencamp.com even before the album was completed. The song is a piece of troubadour-style poetic reportage, chronicling the issues that faced the Louisiana town where racial tensions had recently flared and nooses were found in school yard trees. Jena’s Mayor Murphy R. McMillin wrote that the “Jena” song and video were "so inflammatory, so defamatory, that a line has been crossed and enough is enough." Within just three days of the posting, Mellencamp performed it at San Francisco’s Hardly Strictly Bluegrass Festival on October 5th and another huge audience heard and positively responded to more unreleased material from an album that didn’t have a title, let alone a release date. Later that fall, starting in Terre Haute on October 26th in his native Indiana, Mellencamp and his band set off on a 40-city North American tour that found him playing an 18-song set each night. Typically, five of those songs were unreleased and, hence, unknown to the audience. He boldly performed “Troubled Land,” “If I Die Sudden” and “Jena” back-to-back and most often, even in the nose bleed seats, you could hear a pin drop. He led the audience in a sing-along to the solo acoustic “Young Without Lovers” with enthusiastic participation night after night – no mean feat for a rock audience out to hear the hits. Also rendered solo was “A Ride Back Home,” certainly not anticipated fare for the concert-going crowd but very much appreciated. It was an enlightening experience for both audience and performer at just about every show. Numerous times, he performed “Longest Days,” evoking the special relationship he had with his late grandmother and, on occasion, the ethereal “Don’t Need This Body,” challenging audiences to contemplate mortality. Life Death Love and Freedom studio album. These live versions of Life Death Love and Freedom songs serve to underscore their connection with the human experience. In recognition of that, the songs are presented here just as they were performed: no overdubs or studio enhancements of any kind were added. They come direct from the soundboard to your ears. Songs are organic and, metaphysically speaking, they need air; the best ones touch your soul on some level. These did just that for hundreds of thousands who attended John’s concerts, both before and after the album’s release. Belmont Mall Publishing (ASCAP). All rights administered by EMI April Music, Inc.